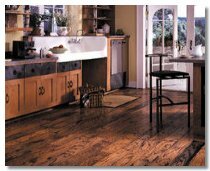 The American Originals Hickory Collection is a 3/8" thick x 5" wide prefinished, engineered Hickory hardwood floor. These floors have micro beveled edges and ends and feature a Permion Urethane Finish including a 25-Year Finish Warranty. 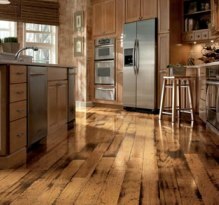 American Originals Hickory can be glued down to wood or concrete subfloors that are on, above and below ground levels. 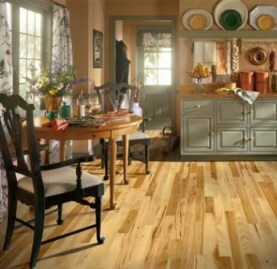 The American Originals Maple Collection is a 3/8" thick, 3" or 5" wide prefinished, engineered Maple hardwood floor. These floors have square edges and ends for a seamless look and features a Permion Finish including a 25-Year Finish Warranty. This can be used for Residential and Commercial use. 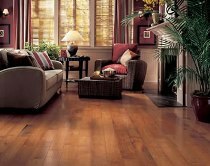 American Originals can be stapled down to wood subfloors and glued to concrete subfloors that are on, above and below ground levels. The American Originals Oak Collection is a 3/8" thick x 5" wide prefinished, engineered Red Oak hardwood floor. These floors have square edges and ends for a seamless look and features a Permion Finish including a 25-Year Finish Warranty. This can be used for Residential and Commercial use. 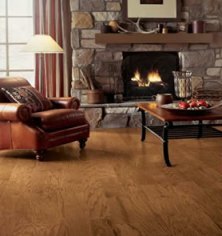 American Originals Oak can be glued down or floated to wood or concrete subfloors that are on, above and below ground levels. 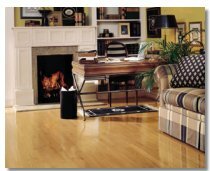 The American Treasures Hickory Collection is a 3/4" thick prefinished, solid hardwood floor available in both 2 1/4" and 3 1/4" widths. These floors have micro beveled edges with ends and features a Dura-Luster Plus Urethane Finish including a 25-Year Finish Warranty. 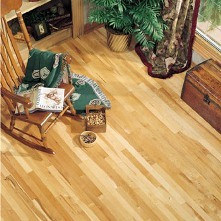 American Treasures Hickory can be nailed to wood subfloors that are on and above ground levels. The American Vintage Collection is a 3/8" thick x 5" wide prefinished, engineered hardwood floor available in both Walnut and Cherry . These floors have micro beveled edges and ends and features a Dura-Luster Plus Urethane Finish including a 25-Year Finish Warranty. 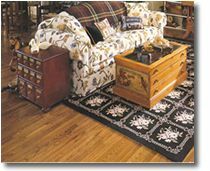 American Vintage can be glued down to wood or concrete subfloors that are on, above and below ground levels. Baltic Plank is a 3/8" thick, 5" wide, prefinished, engineered Oak hardwood floor. These floors have a eased edges and ends and feature the easy care Dura-Luster Plus Semi-Gloss Finish including a 25-Year Finish Warranty. Milled to create an antiqued appearance, Baltic Plank can be glued down to wood or concrete subfloors that are on, above and below ground level. Cavendar Plank is a 3/8" thick, 3" wide, prefinished, engineered Oak hardwood floor. These floors have an eased edge and end treatment and feature the easy care Permion Finish including a 25-Year Finish Warranty. Milled to create an antiqued appearance, Cavendar Plank can be glued or stapled down to wood sublfoors or glued to concrete subfloors that are on, above and below ground level. Kennedale Prestige Plank is a ¾” thick, 3 1/4" wide, prefinished solid Maple hardwood floor. These floors have a micro beveled edges and square end treatment. It features an easy care Dura-Luster Semi-Gloss Finish. 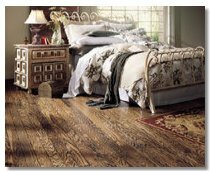 Kennedale Prestige Plank can be nailed down to wood subfloors that are on and above ground levels. 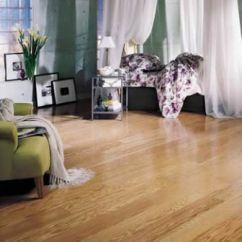 Kennedale Strip is a ¾” thick, 2 ¼” wide, prefinished solid Maple hardwood floor. These floors have a micro beveled edge with square end treatment. It features an easy care Dura-Luster Semi-Gloss Finish. 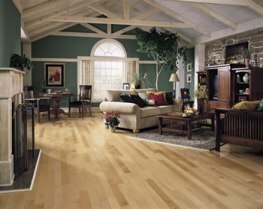 Kennedale Strip can be nailed down to wood subfloors that are on and above ground levels. Natural Choice is a low gloss 5/16" thick, 2 1/4" wide, prefinished, solid hardwood floor, now available in Oak, Ash and Maple . These floors have a square edges and ends and feature the exclusive, easy care Dura-Luster Plus Low Gloss Finish with a Lifetime Structural, 25-Year Finish Warranty. Natural Choice can be glued directly to the subfloor, whether it is concrete or wood. It can also be stapled down to wood subfloors that are on, or above ground level. 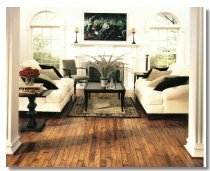 Natural Reflections is a 5/16" thick, 2 1/4" wide, prefinished, solid Oak hardwood floor. These floors have a square edges and ends and feature the exclusive, easy care Dura-Luster Plus Finish with a Lifetime Structural Integrity Warranty. Natural Reflections is the only solid Oak floor that can be glued directly to the subfloor, whether it is concrete or wood. It can also be stapled down to wood subfloors that are on, or above ground level. Northshore 2 1/4" Strip is a 3/8" thick, prefinished, engineered Oak hardwood floor. These floors have a square edge treatment and feature the easy care Dura-Luster Plus Semi-Gloss Finish. Northshore 2 1/4" Strip can be stapled down to wood subfloors and glued down to wood or concrete subfloors that are on, above and below ground level. Northshore 3" Plank is a 3/8" thick, prefinished, engineered Oak hardwood floor. 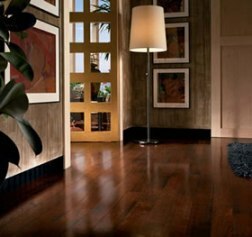 These floors have a square edge treatment and feature the easy care Dura-Luster Plus Semi-Gloss Finish. Northshore 3" Plank can be stapled down to wood subfloors and glued down to wood or concrete subfloors that are on, above and below ground level. Northshore 5" Plank is a 3/8" thick, prefinished, engineered Oak hardwood floor. These floors have a square edge treatment and feature the easy care Dura-Luster Plus Semi-Gloss Finish. Northshore 5" Plank can be stapled down to wood subfloors and glued down to wood or concrete subfloors that are on, above and below ground level. Northshore 7" Plank is a 3/8" thick, prefinished, engineered Oak hardwood floor. These floors have a square edge treatment and feature the easy care Dura-Luster Plus Semi-Gloss Finish. Northshore 7" Plank can be stapled down to wood subfloors and glued down to wood or concrete subfloors that are on, above and below ground level. Rockwell Plank is a 3/8" thick, 7" wide, prefinished, engineered Oak hardwood floor. 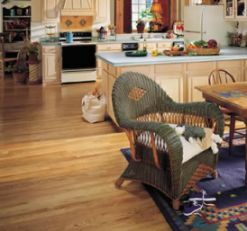 These floors have a eased edges and ends and feature the easy care Permion Finish. Milled to create an antiqued appearance, Rockwell Plank can be glued down to wood or concrete subfloors that are on, above and below ground level. 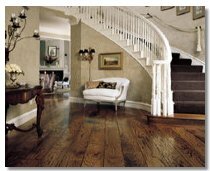 Sterling Prestige Plank is a ¾” thick, 3 ¼” wide, prefinished, solid Oak hardwood floor. These floors have a square edges and ends and feature the easy care Dura-Luster Semi-Gloss Finish. Sterling Prestige Plank can be nailed down to a wood subfloor on and above ground levels. 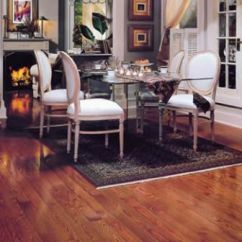 Sterling Strip is a ¾” thick, 2 ¼” wide, prefinished, solid Oak hardwood floor. These floors have a square edges and ends and feature the easy care Dura-Luster Semi-Gloss Finish. Sterling Strip can be nailed down to a wood subfloor on and above ground levels. 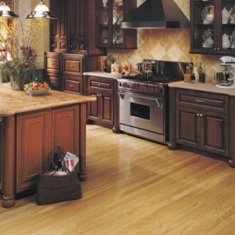 Townsville Strip is a 3/8” thick x 2 1/4" wide, prefinished, engineered Oak hardwood floor. These floors have a square edges and ends and feature an easy care Dura-Luster Plus Low-Gloss Finish including a 25-Year Finish Warranty. Townsville Strip can be glued or stapled down to wood subfloors and glued to concrete subfloors that are on, above and below ground levels. 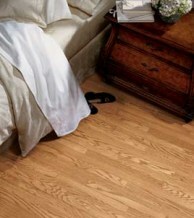 Trumbull Strip is a ¾” thick, 2 ¼” wide, prefinished, solid Oak hardwood floor. These floors have a eased edges and end treatment and feature the easy care Dura-Luster Plus Semi-Gloss Finish. Milled to create an antiqued appearance, Trumbull Strip can be nailed to wood subfloors that are on and above ground levels.